I am still sorting through the dilemma that is this blog, but I couldn't let Bead Table Wednesday (BTW) pass me by. My craft desk is currently covered with the same things that consume my thoughts. On the left is my stack of to-do lists and blog ideas, lists, and ramblings that I've been jotting down since yesterday. On the right is the actual bead work that I have out to do. You can see which of those pictures is larger and thus which one consumes more of my thoughts. Oddly, it's like a battle of my left brain and right brain right there. . . hmmmmm. I guess it's time to see which one wins. Bead Table Wednesday is the brainchild of Heather of HumbleBeads. 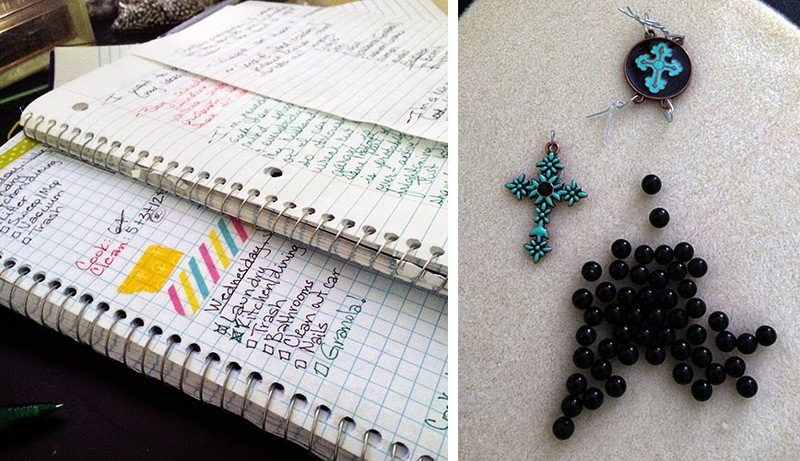 Today she is revealing the Michael's Beading Challenge that she and Lorelei are hosting, but on other Wednesdays you can usually sneak a peek at what's on her desk too. Why don't you play along sometime and share what's on your worktable. Go, right brain (at last from where I am looking at it)!